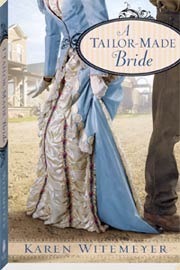 Jericho “J.T.” Tucker wants nothing to do with Coventry, Texas’s new dressmaker. He’s all too familiar with her kind–shallow women more devoted to fashion than true beauty. Yet, except for her well-tailored clothing, this seamstress is not at all what he expected. Hannah Richards is confounded by the man who runs the livery. The unsmiling fellow riles her with his arrogant assumptions and gruff manner while at the same time stirring her heart with unexpected acts of kindness. Which side of Jericho Tucker reflects the real man? When Hannah decides to help Jericho’s sister catch a beau–leading to uproarious consequences for the whole town–will Jericho and Hannah find a way to bridge the gap between them?